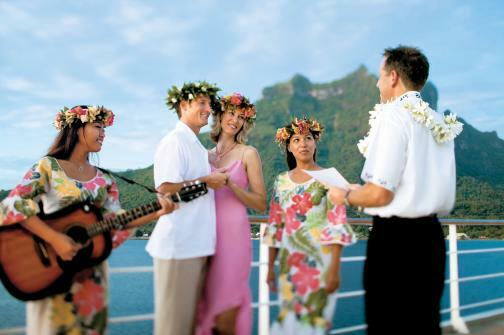 Paul Gauguin Cruises has announced details of a new wedding ceremony and renewal of vows packages at Motu Mahana, the cruise line’s private islet off the coast of Taha’a, or at the InterContinental Bora Bora Resort & Thalasso Spa in French Polynesia. Guests can save $50 by combining this package with the “Romantic Escapade” shore excursion or a pre- or post-cruise stay at InterContinental Bora Bora Resort & Thalasso Spa when arranged by the cruise line. Paul Gauguin Cruises also offers a gift registry for those celebrating a wedding, honeymoon, or other special occasions at pgcruises.celebrationwishes.com.